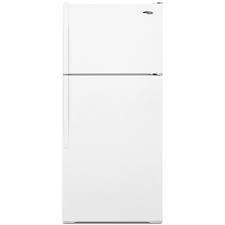 Overall: The Amana A8TXNGFXW Top Freezer refrigerator was the perfect choice for a basic and inexpensive white refrigerator. Although it didn't win any awards for style, it had a generous interior storage capacity, spill-proof glass shelves, and humidity controlled crisper drawers. This specific model of top mount fridge has been discontinued but we are happy to say that Amana still makes some of the most affordable and reliable fridges on the market today. If functionality and affordability is what you're looking for, then you may want to take a look at our favorite top mount models. Reversible Door: This feature is unimportant until you actually need it! The ability to change the door opening from one side to the other is crucial if you're limited on kitchen space. It's a great option to have if your kitchen forces you to open the door only one way. Great Organization Features: Between the humidity controlled produce crispers, the dairy center and the deli drawer, you can easily organize all your food items. Colors: This particular model ONLY came in White. MSRP: $749.00 was Amana's suggested retail, but we found it for substantially less money (15-25% less) even before it was discontinued. While this model was a great choice for those with limited space and budget, there are still so many other top freezer refrigerators to look at. Best of all, they are pretty similar and some even cost a bit less than this one. If this fridge doesn't work for you, no worries. We have a great many reviews of current models that just might be perfect. If you are serious about having a top mount model, then take a look at a few of our favorites.